adam HTT Limited t/a adam is a limited liability company registered in England and Wales with registered number 7718565 and its registered office at The Pinnacle, 170 Midsummer Boulevard, Milton Keynes, MK9 1BP, United Kingdom. When we refer to "we", "us", "our" or "adam" we are referring to adam HTT Limited. adam is committed to safeguarding and preserving your privacy when you visit our websites and applications (including, www.useadam.co.uk, www.sproc.net, http://demand.sproc.net/ etc. - collectively the "Applications"); and provide us or one of our customers or accredited suppliers with information; or communicate electronically with us. Our data protection policies articulate our privacy commitments to our customers, accredited suppliers and service users and these are updated in line with legislative and regulatory requirements. This Policy was last updated on 15th October 2018. Please note that from time to time we may update this Policy. Any amendments will be published to this page so please do return and review this Policy regularly. If the changes are significant, we may provide a more prominent notice or get your consent, as required by law. Information that you provide by filling in forms within the Applications, such as information provided by you or which you provide on behalf of a service user. Information provided to us when you communicate with us directly for any reason. Details of your visits to Applications and the resources that you access, including, but not limited to, traffic data, location data, and other communication data (for example the web browser you use when accessing our Applications). Personal Data - e.g. name, email address, address, postcode etc. Sensitive Personal Data - e.g. care plans, gender, health records etc. For processing and storing for example, we may be engaged in the processing and concluding of your requirement; the processing of your payment transactions and the provision of support services. Any Personal Data which is entered into our Applications will only be processed in accordance with the written instructions and purpose within our contract for the Applications. Our lawful basis for processing is subject to contract between us (adam) and you (the customer). We will retain the Personal Data for the duration of our contract with you. We receive and store information when you interact with the Applications, such as “cookies” and other information when you access our Applications and other content. We might receive information about you from other sources, which may be added to your account information within the Applications. Examples of information we may receive include feedback from customers and service users. To help us make emails more useful to you we often receive a confirmation when you open emails from us if your computer or device supports such capabilities. If you do not want to receive emails from us, please adjust your contact preferences accordingly or contact us directly. Please note we will never ask you to confirm your password or payment details via email. If you receive an email that request this information and appears to have been sent by us, please treat this as fraudulent and do not reply or provide any information. If you receive any such emails, please contact our Data Protection Officer to provide us with further details. Personal Data - e.g. name, email address, address, postcode. Sensitive Personal Data - e.g. care plans, gender, health records. To provide our services or online content, to provide you with information about them and to deal with your requests, resolve your issues and enquiries. We may also make checks to verify your identity and business information. We may also check your business records with Credit Reference Agencies. Such checks are carried out by us to fulfil our contractual obligations with our customers. Your information may also be used for other purposes for which you give your express permission or when required by law. For processing and storing for example, we may be engaged in the processing and concluding of your offer; the processing of your payment transactions and the provision of support services. Our lawful basis for processing is through legitimate interests having assessed these interests against the benefit to you of the services we provide to you and the risks associated with the information we share. Our lawful basis for processing your data in relation to receiving marketing material is consent which you actively provide via a tick box during the onboarding process. We may retain archived copies of your information as required by law or for legitimate business purposes (including to help address fraud). We may share your information where we believe that disclosure is reasonably necessary to comply with a law, regulation or legal request; to protect the safety, rights or property of the public or any person; or to detect, prevent or otherwise address fraud or security issues. Where applicable we may disclose your Personal Data to an affiliated company in order to run our business. All affiliated companies are subject to equivalent data protection policies and procedures. We may share your information where it is necessary to provide you with a service you have expressly requested. We may share information with other companies and organisations for fraud protection and credit risk reduction. We may where we deem it necessary or at request of our customers, complete searches with credit reference agencies to assess a Supplier’s financial risk. We may compare our mailing list to lists received from other companies to avoid sending unnecessary messages to you. Third-party service providers – We appoint third-party providers as data processors to perform some functions on our behalf. We will share information with such data processors in order for them to assist us in providing services to you and to run our business. Examples of services provided on our behalf by our third-party service providers include: providing marketing assistance, accounting packages and CRM system. In sharing your information with these parties, we are pursuing our legitimate interests having assessed those interests against the benefits to you of the additional efficiencies gained by us using the selected third-party service providers and taken account of the types of personal information we share. We may share anonymous, aggregate information with third parties for research and marketing purposes but we won’t share your information with any other organisations for marketing, market research or commercial purposes, unless we have obtained your consent or you have requested a service provided with or in conjunction with another organisation. Sending information over the internet is generally not completely secure, and therefore we can't guarantee the security of your data while it's in transit. Transmission of such data is therefore entirely at your own risk. We have procedures and security features in place to keep your data secure once we receive it. Where we have given you (or where you have chosen) a password so that you can access certain parts of our Applications, you are responsible for keeping this password confidential. You should not at any time share your username or password with third parties to allow them to access Applications. If you become aware of any unauthorised use of the Applications you should contact us immediately in order that we may take the appropriate steps. You should only use your own password and login details to access the Applications and should not share those login details and passwords with any third parties or allow any third parties to access your own device when logged in. Data that is provided to us is stored on our secure servers. Details relating to any transactions entered into on our Applications will be encrypted to ensure its safety. We use a third-party provider, LiveAgent to supply and support our LiveChat service, which we use to handle your queries in real time. If you use the LiveChat service we will collect your name, email address (optional) and the contents of your LiveChat session. This information will be retained for duration of our contract with LiveAgent. We use a third-party provider, Elite Telecom to supply the infrastructure for our support helpline. Elite Telecoms is under contract with adam to provide this service. If you call our support helpline we will collect your calling line identification and a recording of your call. During your call we may collect your name and email address to enable us to assist you with your enquiry. This information is utilised for aggregate management information and to monitor the quality of our support services. This information shall be retained on secure servers for the duration of our contract with Elite Telecom. Our technology, SProc.Net, does not operate outside of England and Wales. This means that any information provided via SProc.Net is hosted and processed at data centres within the UK. You have the right to request details of the Personal Data we hold about you. You have the right to request rectification of your Personal Data. You have the right to request the restriction or suppression of processing of your Personal Data. You have the right to request a copy of your Personal Data in a commonly used and machine-readable form. You also have the right to lodge a complaint with your data protection supervisory authority. If you are based in the UK, this is the Information Commissioner's Office. We may ask you to verify your identity using reasonable means, i.e. requesting you provide a proof of identity document. If we have asked you to verify your identity, we will proceed with your request upon completion of verifying your identity. We will respond to your request within one calendar month from the day we receive your request. If we need to extend our response period to fulfil your request we will inform you within one month of the receipt of the request and explain why the extension is necessary. We will only extend the period by a further two months. We shall respond to your request free of charge unless your request is found to be manifestly unfounded or excessive in which case we will charge you a reasonable fee. This fee will be to cover the administrative costs of complying with your request only. If we have advised that a reasonable fee is chargeable, we will not proceed with your request until we have received the fee. If we refuse to respond to a request because it is manifestly unfounded, excessive or we have an exemption, we will write to you and explain our decision. If you disagree with our decision you also have the right to lodge a complaint with your data protection supervisory authority. If you are based in the UK, this is the Information Commissioner's Office. You have the right to seek a judicial remedy. We are committed to ensuring that your information is secure. We have stringent physical, electronic and managerial procedures to safeguard and secure your data. 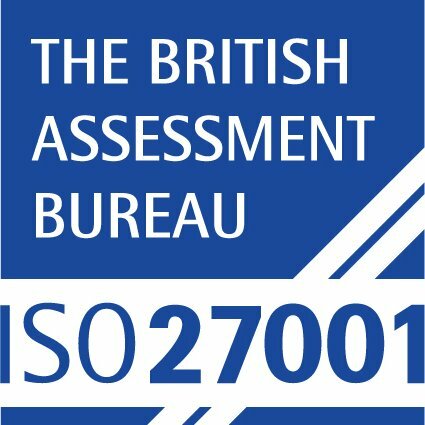 We are ISO 27001 Accredited. The scope covers how we manage information security in providing commissioning tools for procurement of complex services in the public sector. We commission regular independent penetration testing of our infrastructure to ensure that we keep our Applications free from vulnerabilities. adam may use your data to inform you of other products or services available from adam and its business partners where you have consented to receive such communications. adam may also contact you via surveys to conduct research about your experience and opinion of the current services or of potential new services that may be offered. You may stop the receiving of future promotional emails from adam by following the specific instructions to opt out in the email you receive. These instructions explain how to stop receiving such emails. Cookies are small text files that are stored on your web browser in order to enable your complete usage of the Applications. They temporarily create a unique user number to track your usage for each session and to make sure that the Applications work for you at your appropriate administration levels. The Applications will store the minimal number of cookies required per session and only those that are essential for your operation of the Applications. Since cookies will allow you to take advantage of some of the Applications' features, we recommend that you leave them turned on. For instance, if you block or otherwise reject our cookies, you may not be able to utilise features such as LiveChat. You have the ability to accept or decline cookies through your browser settings. Most web browsers automatically accept cookies, but you can usually modify your browser setting to decline cookies if you prefer. If you choose to decline cookies, you will not be able to use our websites and applications. EAP.AppTitle End of session This is required to display the application title on each page in SProc.Net. EAP.LOGOUT End of session This is required to provide the correct logout page whenever a User logs out of SProc.Net. EAP.CULTURE 30 days This is required to provide the correct language for the User e.g. English. EAP.Root End of session This is required to provide the correct login page e.g. if the User clicked a link within an email from SProc.Net to be directed to the SProc.Net login page. EAP.AppKey End of session This is required to identify the application that the User is requesting to use. EAP.CREDCACHE 30 days This is required so that the application knows whether we should be caching the User's credentials. Note: This cookie does not store User credentials itself. EAP.UTKN End of session This is required to store the user session token. EAP.InitDst Earlier of 30 days or once it has been used. This is required to support login-through requests (e.g. if you clicked a link from an email). ASP.NET_SessionId End of session This is required to record the .Net user session token. Please do not hesitate to contact us by emailing us at enquiries@useadam.co.uk or in writing to The Pinnacle, 170 Midsummer Boulevard, Central Milton Keynes, MK9 1BP. The Pinnacle, 170 Midsummer Boulevard, Milton Keynes, MK9 1BP, United Kingdom. VAT number: 198 5733 49.